What’s Inside: Easy and adorable Hot Dog Mummies are the perfect savory Halloween party appetizer! Ready in 15 minutes and only two ingredients required! 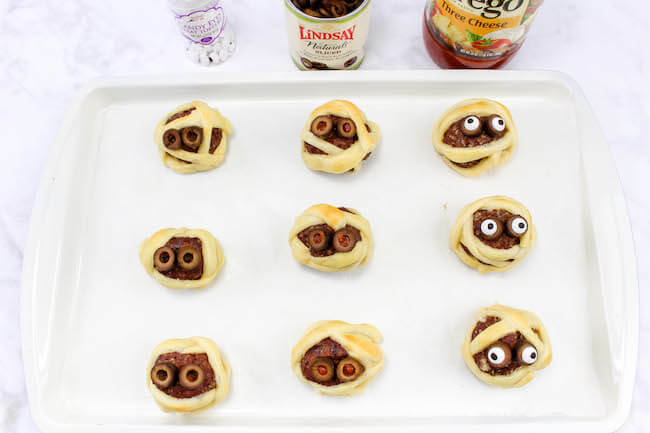 Last year we shared these adorable Mummy Meatballs, so this year we decided to add to our Halloween party spread and make Hot Dog Mummies! Just like our Mummy Meatballs, Hot Dog Mummies are super easy to make — in fact, they’re even easier! From start to finish, it only takes about 15 minutes to make these hot dog mummies…and you only need a minimum of two ingredients! We love to use crescent dough because it’s such a versatile ingredient, plus it tastes delicious when baked! 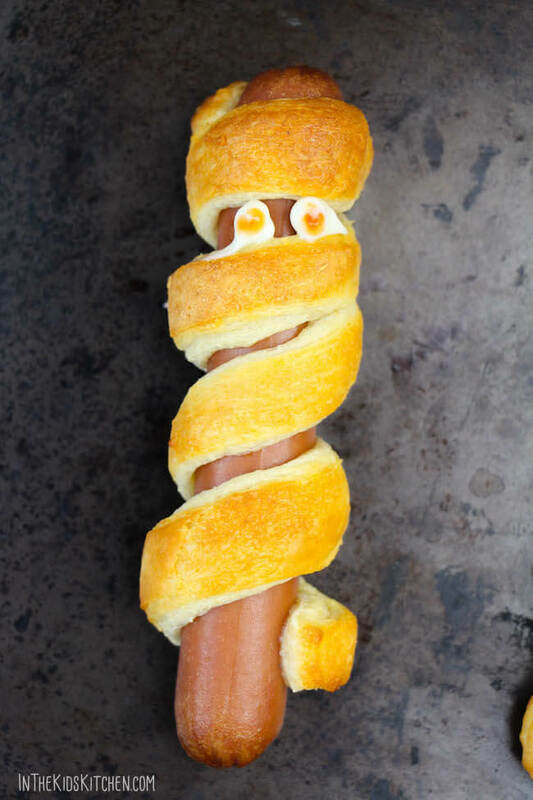 Not only are mummy hot dogs cute, they actually are delicious! Serve our hot dog mummies with ketchup, mustard, or enjoy them plain! 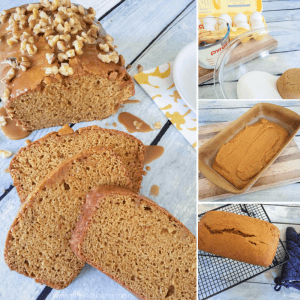 A free printable copy of this recipe is available at the bottom of the post, after photo step-by-step instructions. Preheat oven according to directions on crescent dough package (usually either 350°F or 375°F). While oven preheats, open can of cough and unwrap into sheets. Separate the dough along perforations into rectangles, but not into triangles. Press any remaining perforations with your fingers to seal them so that you have solid rectangles of dough. 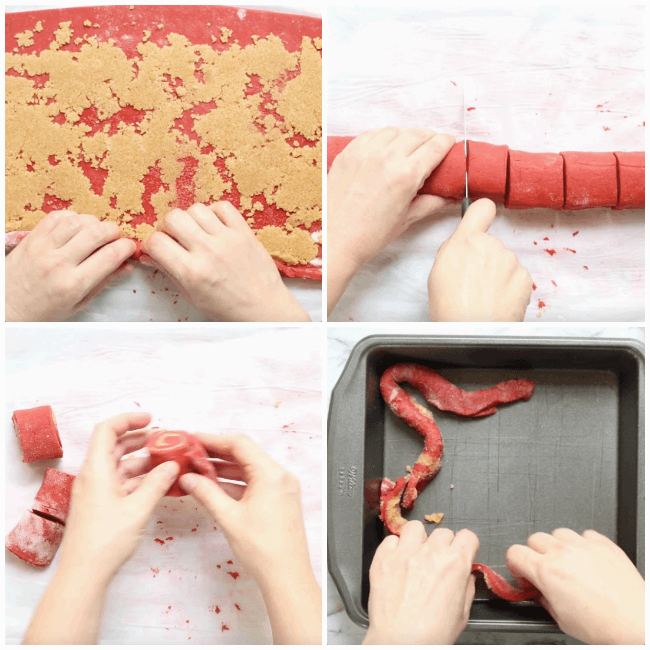 Use a knife to slice the rectangles of dough into narrow strips, about 1/2″ wide. You want one strip of dough per mummy hot dog. 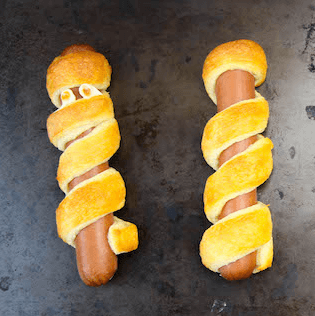 Wrap one strip of dough around each hot dog, so that there is space between the dough and it reaches from top to bottom of the hot dog. Add two drops of mustard near the top of your hot dog mummies (on the hot dog itself) to be the eyes. You could also use edible eyeballs instead and add them AFTER the baking. Or you can skip the eyes altogether if you don’t have any on hand. 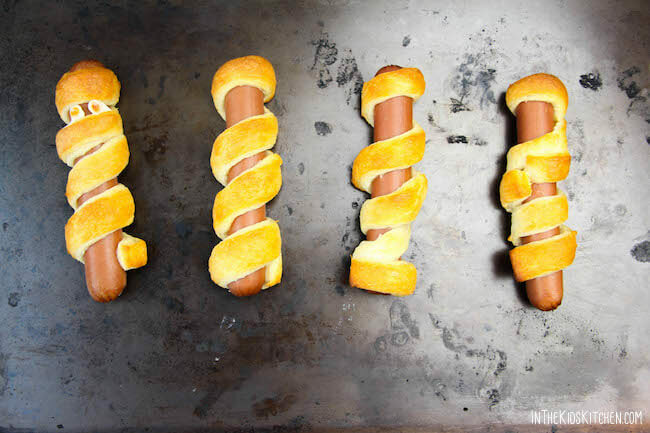 Place your hot dog mummies on a baking sheet prepared with non-stick cooking spray and bake for 10-15 minutes, or until the dough turns golden brown on the outside. 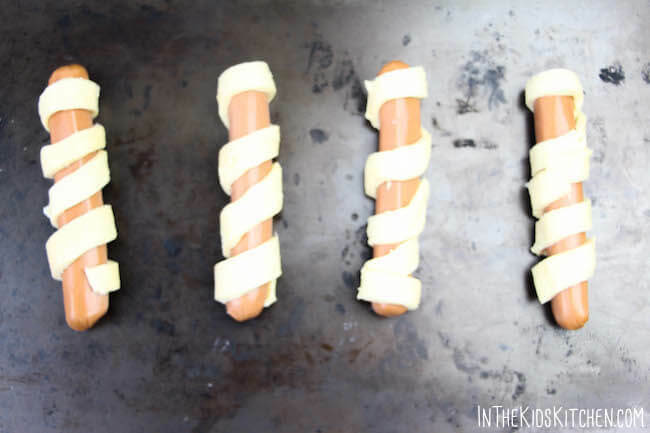 Easy and adorable Hot Dog Mummies are the perfect savory Halloween party appetizer! Ready in 15 minutes and only two ingredients required! Preheat oven according to directions on package. Open can of cough and unwrap into sheets. Separate the dough along perforations into rectangles, but not into triangles. Press any remaining perforations with your fingers to seal them so that you have solid rectangles of dough. 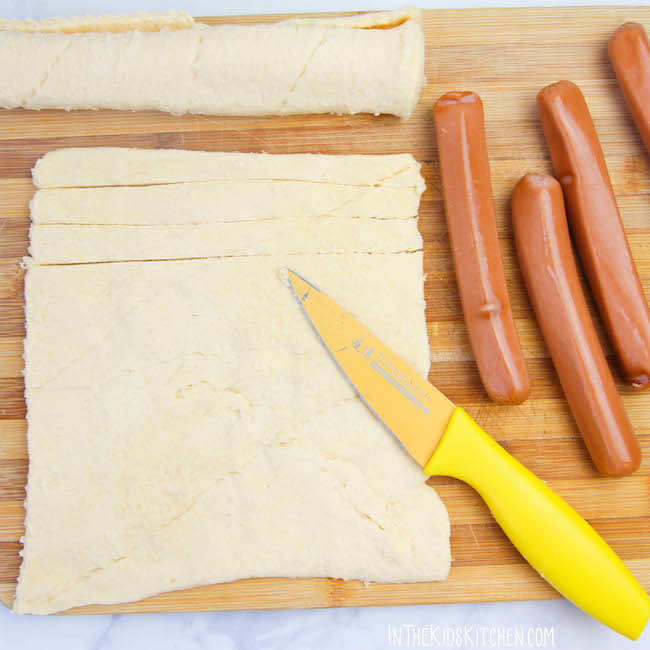 Use a knife to slice the rectangles of dough into narrow strips, about 1/2" wide, so that you have one strip of dough per hot dog. Add two drops of mustard near the top of your hot dog mummies (on the hot dog itself) to be the eyes. 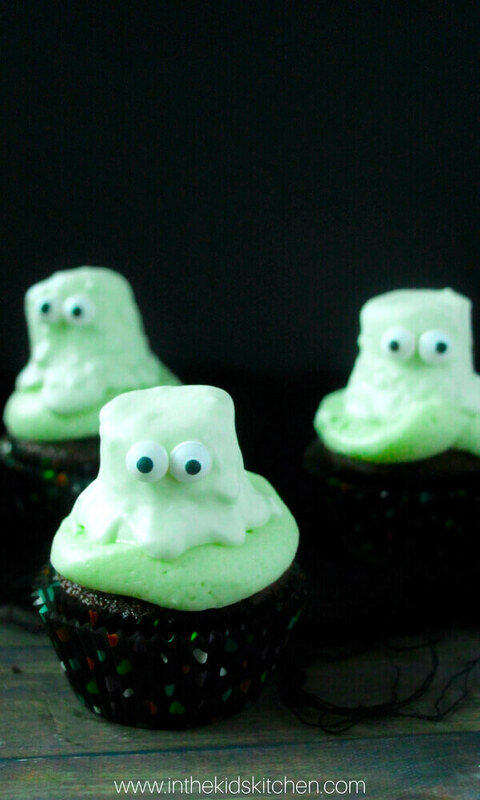 A spooky Halloween cupcake recipe perfect for slime-loving kids, these Slime Monster Cupcakes are sure to be a hit at your Halloween festivities! 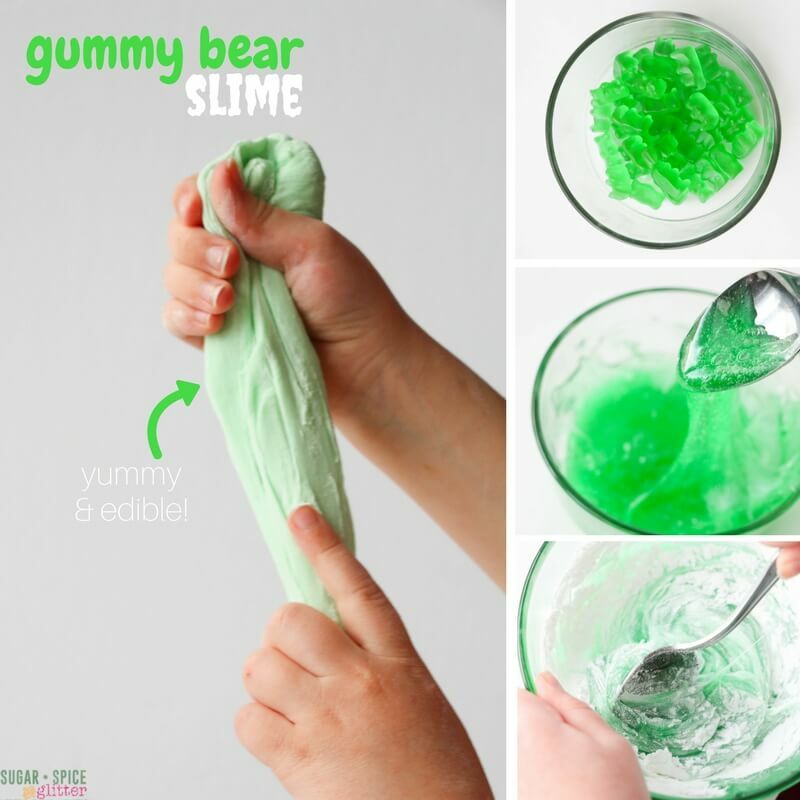 Are your kids obsessed with slime? You can make these Slime Monster Cupcakes two ways – to just look like a slime monster perched on top, or you can actually fill them with “slime” (aka, dyed vanilla pudding). The second option can be a bit messy, so be prepared! If serving at a Halloween party where people will be wearing costume, you might want to warn them about the slime inside first! While we provided a recipe for homemade chocolate cupcakes, feel free to swap in a boxed chocolate cake mix. The real winner here is that delicious homemade buttercream frosting – which would be a crime to replace with the jarred stuff. However, if you need a dairy-free alternative, check out Stacey’s Coconut Oil Frosting. Tip: skip the slime filling or at least warn guests if serving at an event to prevent unexpected slime-costume disasters. Add remaining icing sugar 1/2 cup at a time until you reach your desired consistency. Add food colouring, if using. If adding a slime filling, dye the vanilla pudding green, and then scoop into a piping bag. Make a hole in the center of the cupcake and fill with the green pudding. TIP: While you can use a knife to make a hole in your cupcakes, these handy Cupcake Corer tools make this step a breeze! Melt the candy melts with the shortening for 25 seconds, stir, and reheat if necessary. 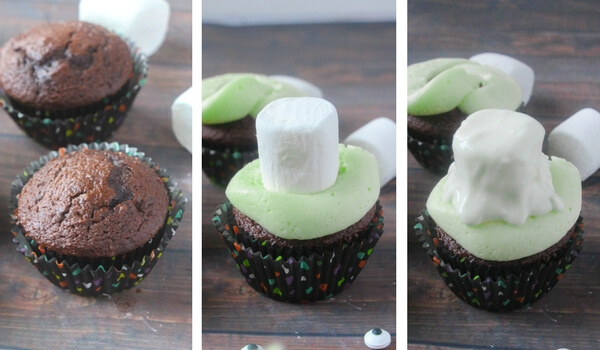 Place a large marshmallow in the center of each cupcake and spoon 1-2 Tablespoons of the candy melts overtop. Use the back of a spoon to help the candy melts move if needed. Repeat with the other ghost cupcakes. After each ghost has dried for about 5 minutes, attempt to attach the eyes – if the candy melts are still too soft, give it another couple minutes before re-attempting. 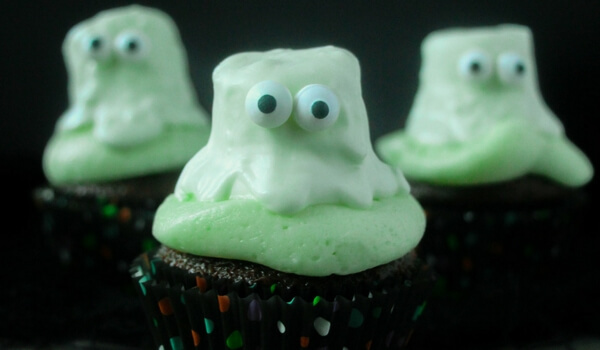 A spooky Halloween recipe perfect for Slime fans, these Slime Monster cupcakes have an optional slime filling! If adding a slime filling, dye the vanilla pudding green, and then scoop into a piping bag. Use a cupcake corer to make a hole in the center of the cupcake and fill with the green pudding. Repeat with the other ghost cupcakes. After each ghost has dried for about 5 minutes, attempt to attach the eyes - if the candy melts are still too soft, give it another couple minutes before re-attempting. 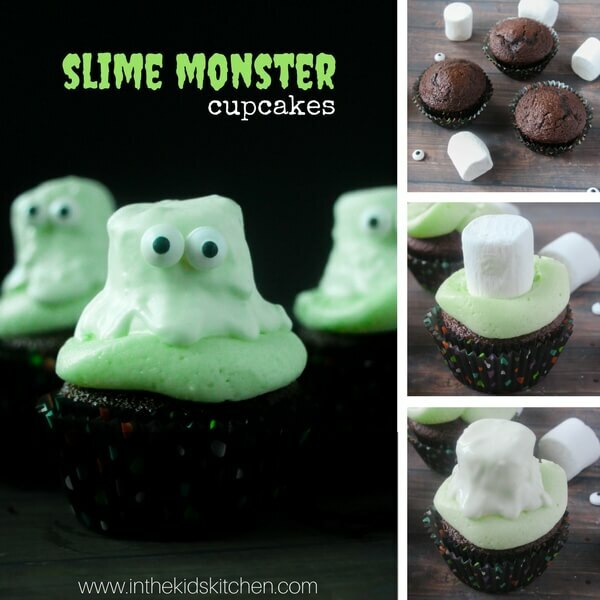 These Slime Monster Cupcakes are perfect for Halloween and their sneaky slime filling is a fun surprise for little slime fans! 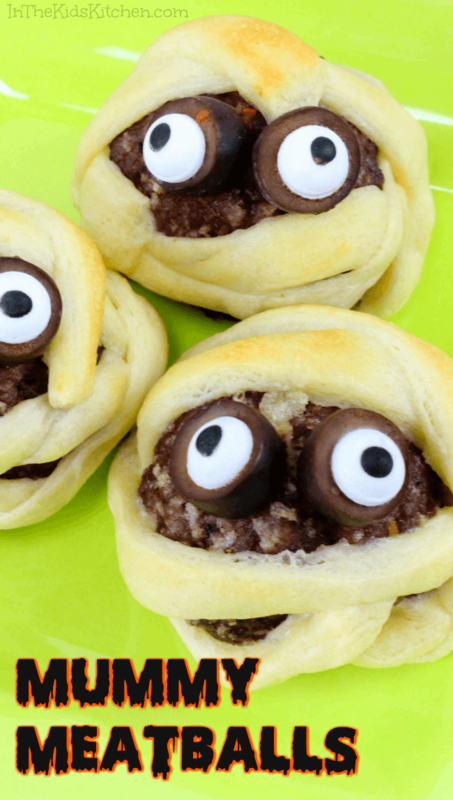 For more delicious Halloween recipes, check out our Cinnamon Bun Zombie Guts recipe or our Cute and Easy Halloween Spider Cookies. Yes, you CAN be a fun mom while encouraging the kids NOT to eat too much candy! 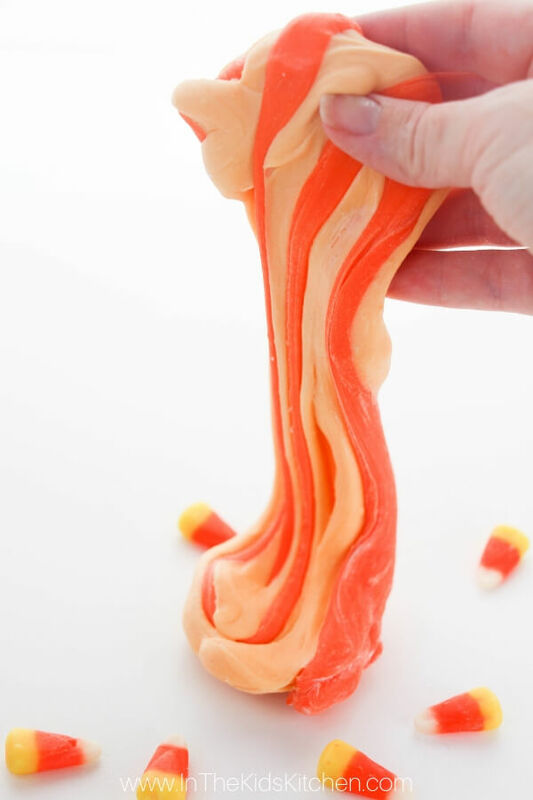 Instead, use that Halloween candy to make a fun Edible Gummy Bear Slime or this stretchy Edible Candy Corn Slime! 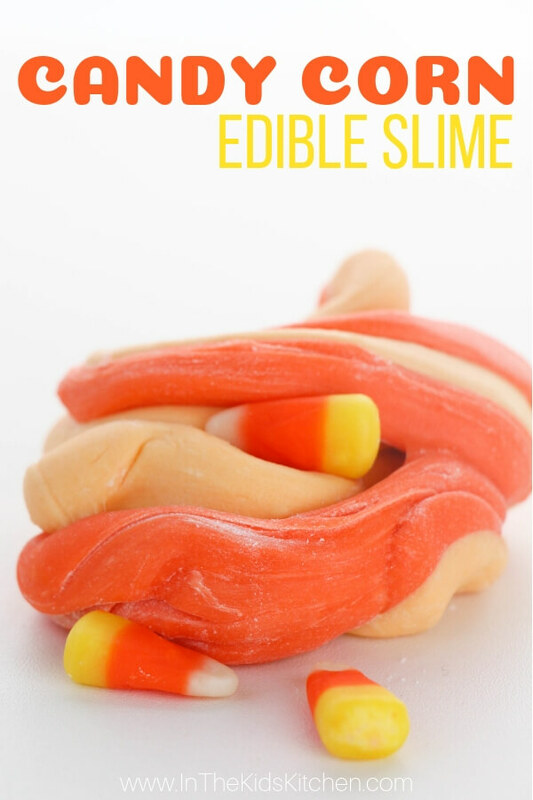 This unique Candy Corn Slime is perfect for fall and is perfect for letting younger siblings in on the slime fun. My daughter begs me to buy a bag every year, and without fail, we get it home and quickly remember how much we don’t like it. So, stuck with a bag of candy corn that we were not going to eat, I decided to get creative and started experimenting with various concoctions to try to make a fun edible candy corn slime. 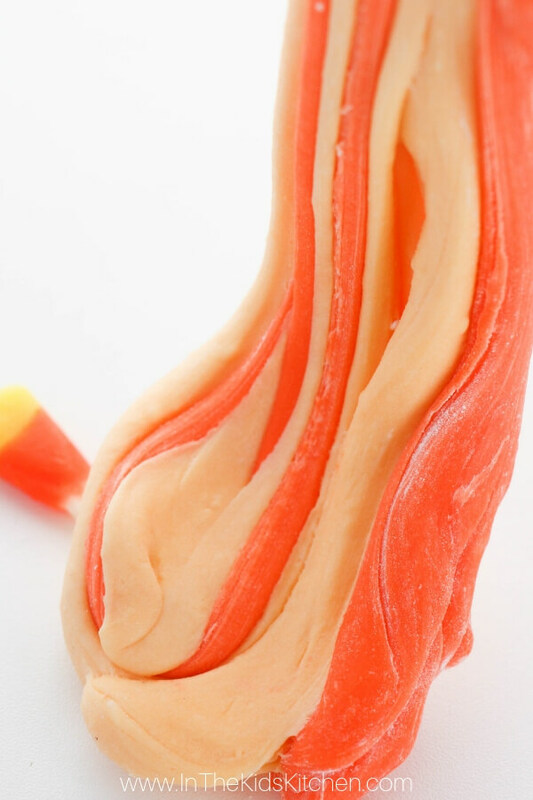 I initially wanted to just use melted candy corn to make a edible candy slime similar to my (now viral) Starburst Candy Slime recipe, but the candy corn hardened really quickly using that method. 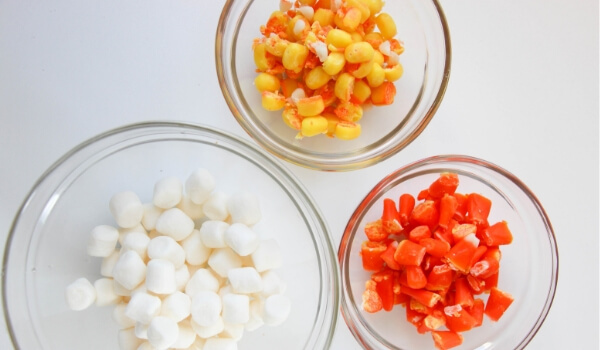 However, mixing the candy corn into our Marshmallow Slime recipe ended up being perfect! 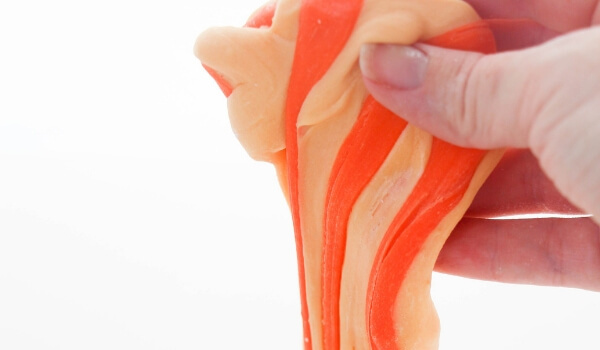 It still hardens a bit faster than our other candy slime recipes, but you can easily return it to it’s former stretchy state by warming it up in the microwave (just be super careful as it can get hot quickly). 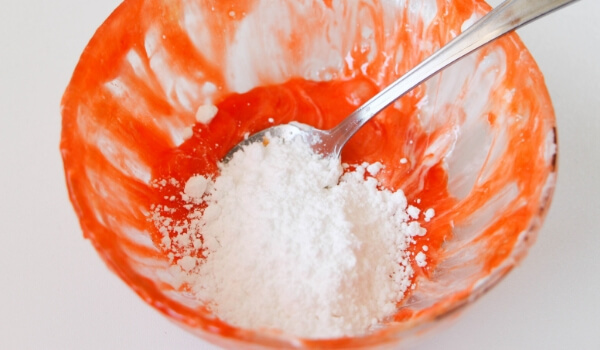 This super simple candy corn slime can be made in a couple different ways. I wanted to have those pretty stripes for the pictures so I chopped up the candy corn and made a yellow and an orange batch, but you can simply mix it all together for one big batch of orange edible candy slime. You can also microwave the candy corn right away with the marshmallows, or mix them in halfway through – I prefer to just get it all zapped together in the first place (even if it resembles molten lava for a couple minutes). 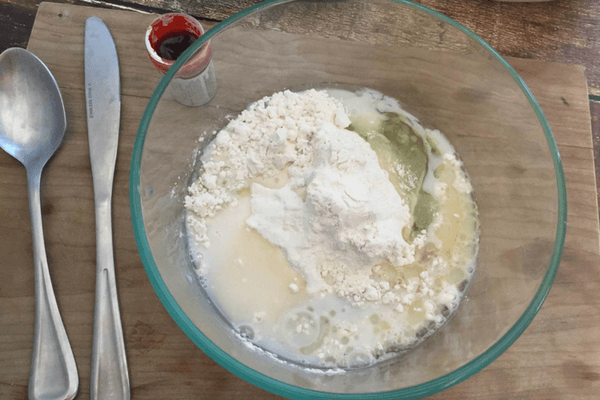 This recipe does get HOT so I do not recommend having children help with the heating stage or the kneading stage until you have checked that the slime is no longer hot. 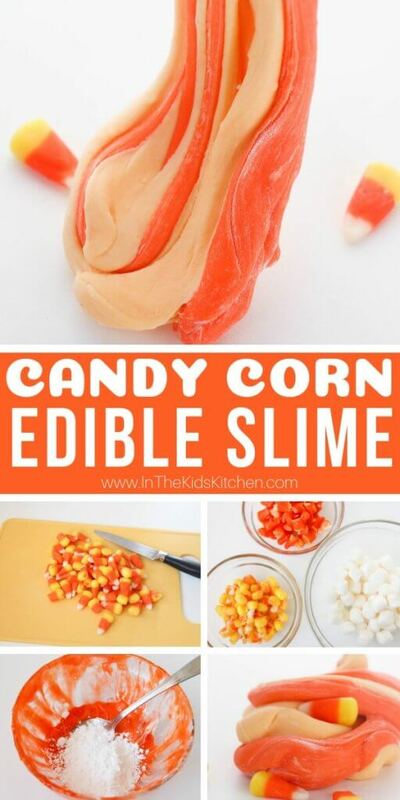 However, once you’re done, the results are a fun stretchy edible candy slime that tastes like candy corn marshmallows! Tip: this edible slime can be stored in a ziplock bag in between uses and reheated for 25 seconds when you want to play again. It will get hot, so a grown-up must check it before handing it off to kids. You may need to add more powdered sugar as you play and you may want to rub some oil on your hands if your hands get sticky. If making a two-tone striped candy slime, chop off the white and yellow ends of the candy corn and place in a small bowl. Place the orange centers in a second bowl. Combine 1/2 Tablespoon of oil, 3/4 cup of marshmallows and one color of the candy corn in a medium-sized microwave-safe bowl. Zap for 25 seconds, stir well, and reheat as needed. When the marshmallows are completely melted, stir in a couple tablespoons of icing sugar. The mixture will be hot so be careful. 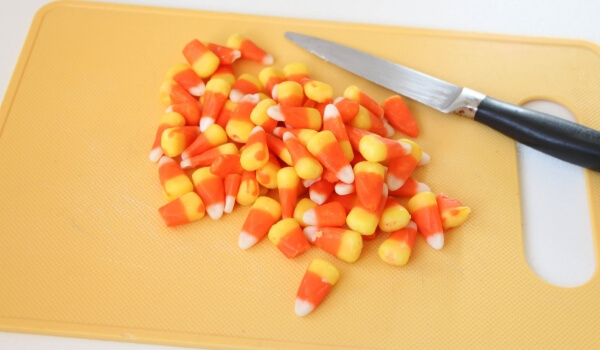 Fold the molten lava (I mean, candy corn mixture) onto a cutting board and when cool enough to knead, knead with the icing sugar until not sticky. Repeat with second color batch. Twist the two slimes together and stretch! Reheat for 25 seconds if the slime gets too hard and take precautions to ensure the slime is cool enough for the kids to touch. 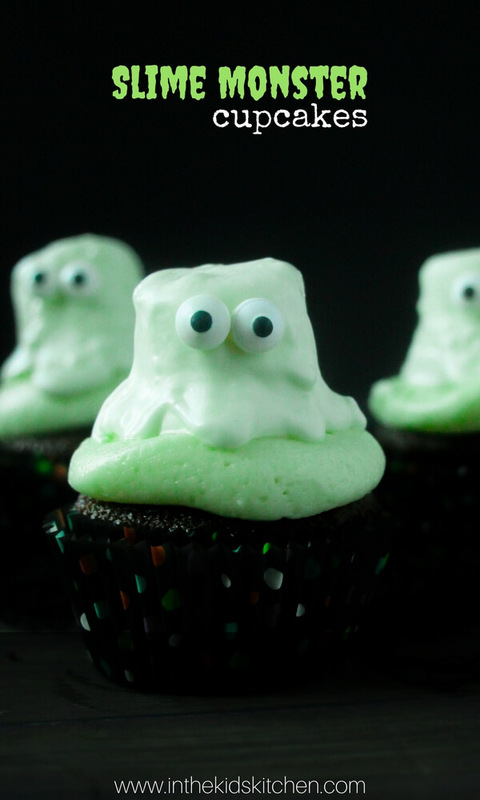 Related: For more Halloween slime fun, try our Slime Monster Cupcakes! 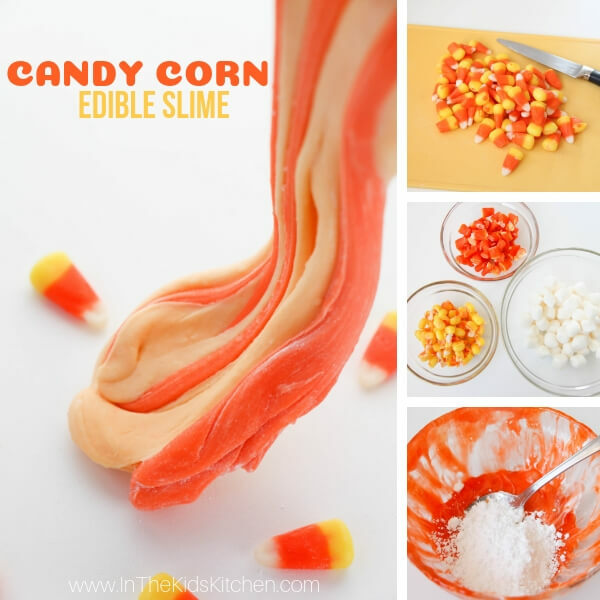 A fun edible candy corn slime recipe for fall. This Edible Candy Corn Slime is a fun way to use up candy corn and the perfect fall slime recipe to include all of the kids! 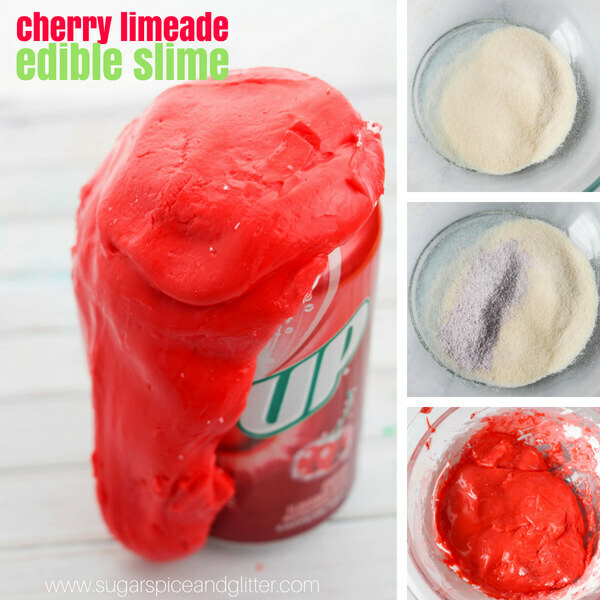 For more fun edible slime recipes, check out our Edible Gummy Bear Slime or our Cherry Limeade Slime. 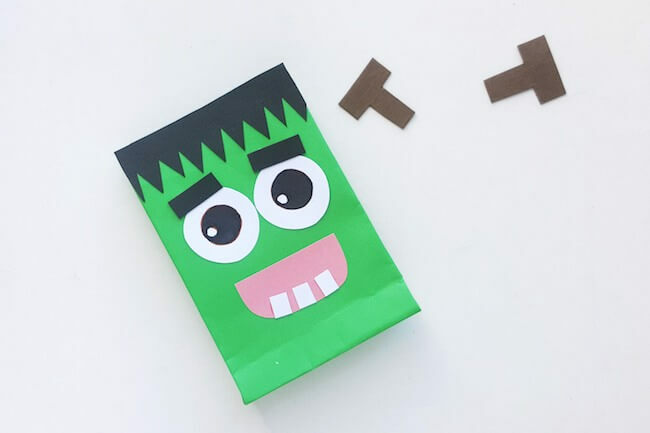 What’s Inside: A super cute (and easy) tutorial to make Friendly Frankenstein DIY Halloween Treat Bags! Free printable included. 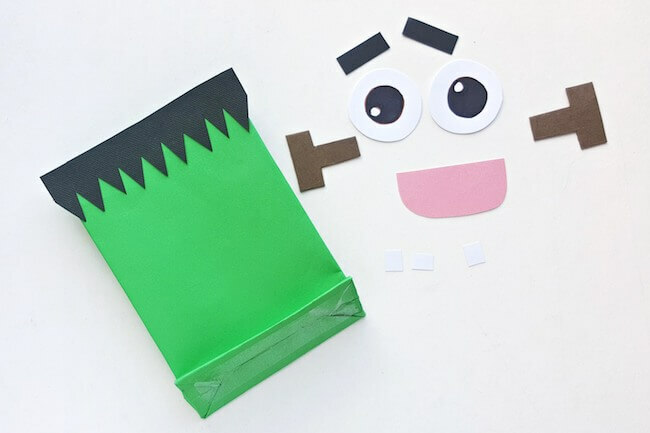 Halloween treat bags are perfect for packing party favors, passing out candy during Trick or Treat, or simply as a fun Halloween kids craft. Instead of buying a bunch of cheapie plastic Halloween treat bags, why not make your own? 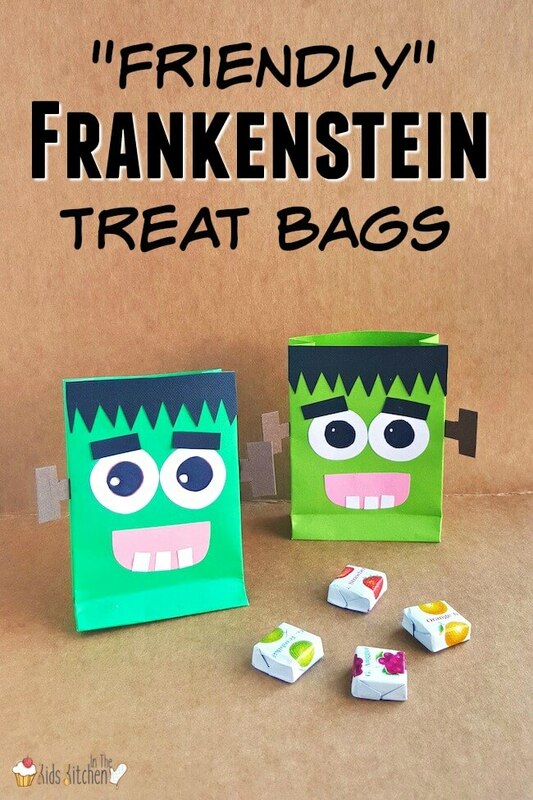 Our Friendly Frankenstein DIY Halloween Treat Bags are paper based, so they biodegrade and are hopefully a bit better for the planet. These homemade Halloween treat bags would also be a fun classroom craft that the kids can make themselves. 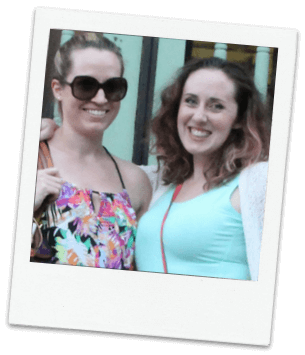 Only simple supplies are needed, and with our free printable template, it’s an activity that can easily be done with a big group. My girls don’t like gory or really scary stuff (nor do I), so we try to keep our Halloween activities “semi-spooky” and kid-friendly. 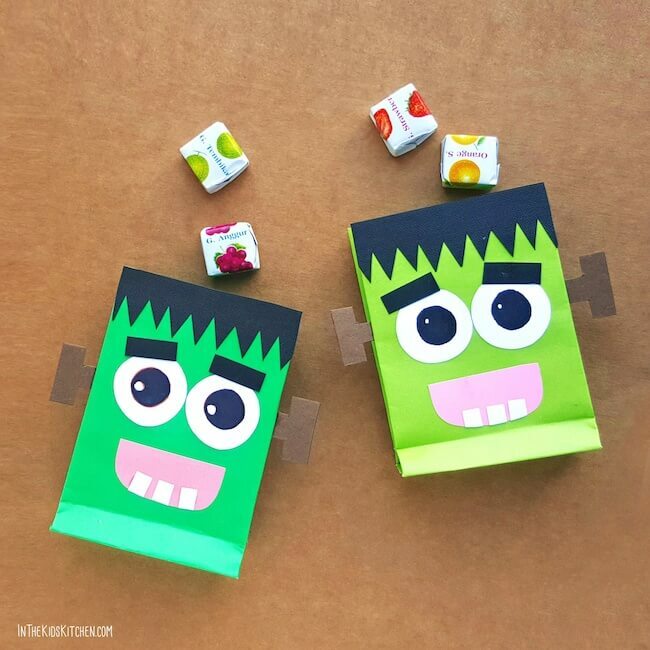 Our Friendly Frankenstein DIY Halloween Treat Bags are a FUN (not scary) Halloween craft that kids will love, and is easy to set up with simple, inexpensive supplies. 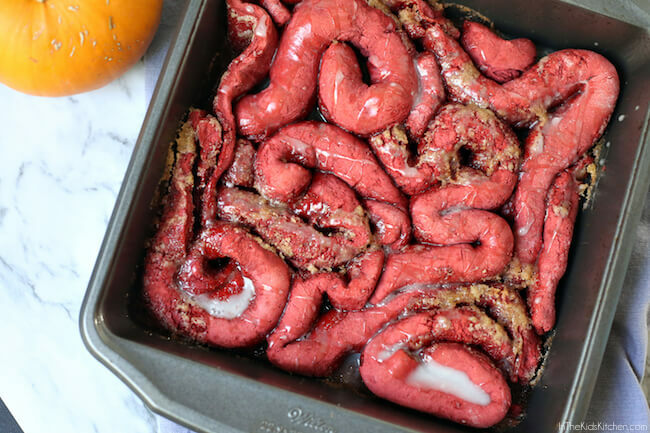 Related: These creepy-cool Zombie Guts Cinnamon Rolls are a guaranteed Halloween party hit! Don’t worry, they’re not really scary and they taste absolutely delicious! First, print our free Frankenstein template and cut out the pieces. There are two PDF patterns: one is blank so you can trace onto the colored construction paper of your choice. There is also a colored patten if you have a color printer. Those pieces can be glued directly onto your treat bags. Once you have all your pieces cut, begin gluing them to your green bags. TIP: If you don’t have green paper bags available, you could also use regular brown paper lunch bags and paint them green first. The strip with the zig-zag border should be glued along the open end of the bag. This is Frankenstein’s hair, and you want that to be at the top so his face is right-side-up when the bag is in use. Glue the eyes and the eyebrows right below the hair; keep a gap between the hair and the eyes. Glue the mouth and then glue the 3 square patterns (tooth) along the bottom side of the mouth’s inner part. Glue the t-shape patterns (Nuts and bolts) on both sides of the paper bag. Feel free to add any other personalizations you like, such as a stitch mark on the face. Allow all glue and details to dry fully before using your Halloween treat bags. 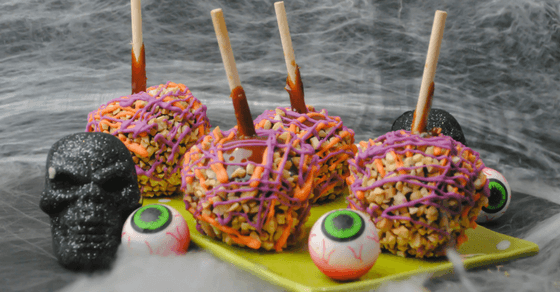 Be sure to check out this HUGE collection of kid-made Halloween snacks! Warning! This Zombie Guts Cinnamon Rolls recipe is not for the squeamish! But don’t let looks fool you, these “Zombie Guts” are actually super delicious red velvet cinnamon rolls! They’re perfect as a ghoulish Halloween party treat or a surprise for your favorite Walking Dead fans. My husband is a huge fan of “The Walking Dead” (both the TV show and original comic series). I knew he would get a kick out of these goofy & gory Zombie Guts cinnamon rolls! Kids also love this gross-out dessert because it looks just like “guts” of course! And tastes amazing! To complete your Halloween party table, check out our Easy Mummy Meatballs and Halloween Marshmallow Pops! Also, for a savory “guts” recipe, check out our friend Kathy’s Pizza-stuffed Crescent Rolls Intestines. Combine yeast, brown sugar, and warm water in mixer bowl. Whisk thoroughly and sit for at least 5 minutes until bubbly. Add in salt, box cake mix, optional food dye and flour a little at a time, mixing in between with a dough hook until you have a dough texture. Scrape the sides, roll into a ball, cover, and let rise for 1 hour. After an hour, flour a large surface and knead for a few minutes, then roll out into a large rectangle. Cut sides that are uneven. Mix together melted butter and brown sugar, and sprinkle over your dough. Sprinkle cinnamon as evenly as possible. Flatten with a rolling pin. Roll up into one long roll, then cut every 2 inches. Once rolled, unroll each of them and fold in half. Arrange in a greased 8×8 inch baking dish so that it looks like “guts.” Cover and let rise another 45 minutes. While dough rises, preheat oven to 350°F. Remove cover from dough and bake at 350°F for 25 – 30 minutes. Once finished cooking, whisk together glaze ingredients in a medium mixing bowl and drizzle over rolls. Printable version of this recipe available at bottom of post. 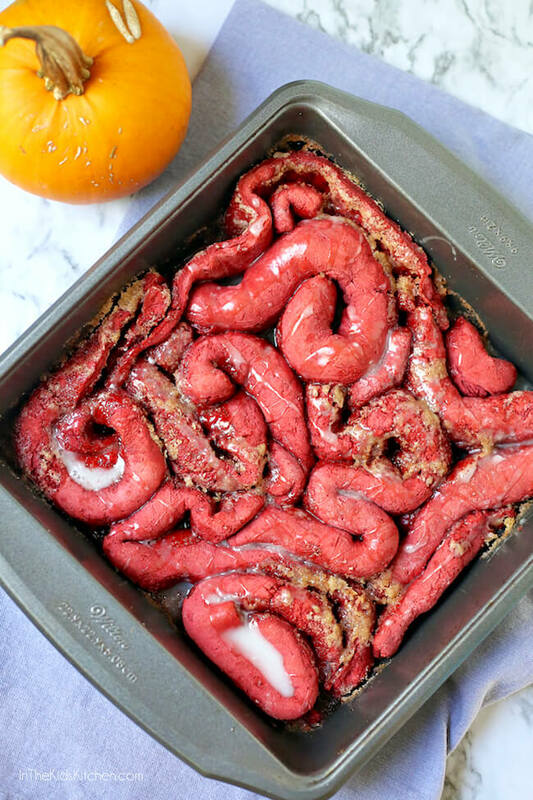 We adapted our recipe for this “Zombie Guts” dessert from the recipe for Red Velvet Cinnamon Roll Guts in Kitchen Overlord’s Dead Delicious Horror Cookbook. This awesomely unique cookbook features 69 gross-out recipes for horror fans, Halloween enthusiasts, or anyone looking for a dish with serious shock-value. There’s even modifications for gluten-free, paleo, and vegan diners! 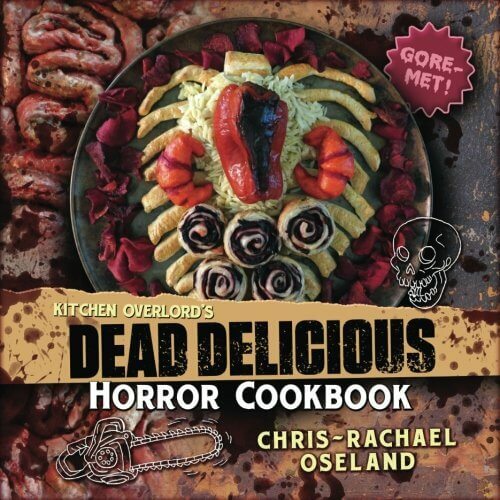 Grab your copy of Kitchen Overlord’s Dead Delicious Horror Cookbook from Amazon just in time for Halloween! Arrange in a greased 8x8 inch baking dish so that it looks like “guts." Cover and let rise another 45 minutes. Remove cover from dough and bake at 350°F for 25 - 30 minutes. 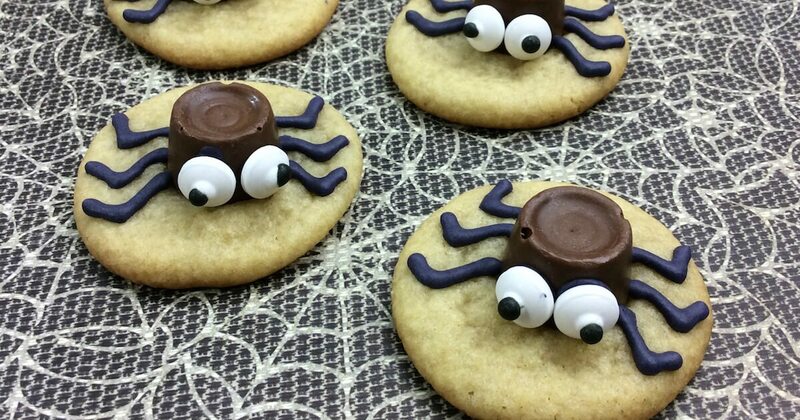 Inside: An adorable (and easy) recipe for party perfect Halloween Spider Cookies. If you’re looking for an easy Halloween dessert that kids will love (and can help create), then you’ve come to the right place! 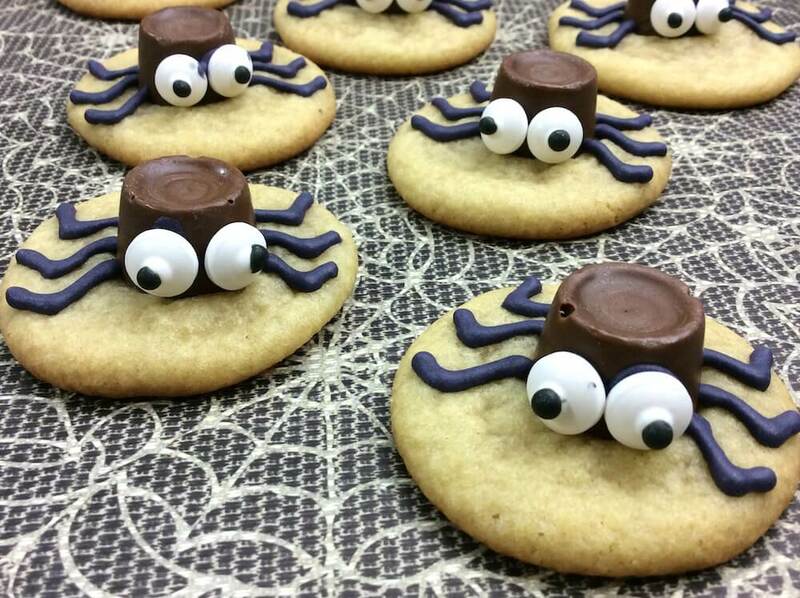 Aren’t these Halloween Spider Cookies just the cutest?! They couldn’t be easier to make — only four simple ingredients and ready in about 30 minutes! Preheat oven to 350°F and prepare a cookie sheet. 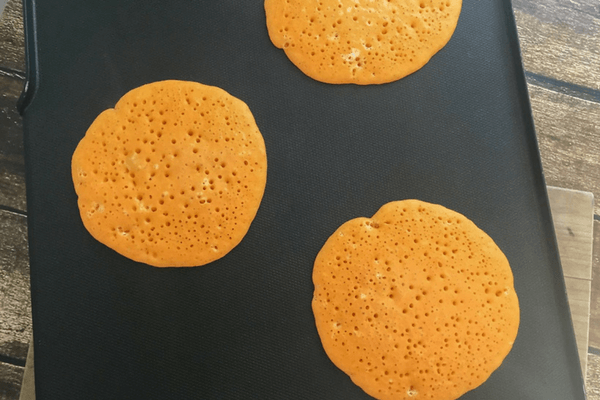 Tip: We love these reusable silicon baking mats because they’re non-stick and you only need to buy them once! Tip: If you really want to get into the Halloween spirit, try this recipe for Pumpkin Snickerdoodle Cookies from Sugar Spice & Glitter! Allow cookies to cool for about 5 minutes (when they are cool enough to handle, but still warm to the touch). Arrange one Rollo in the center of each cookie and gently press down so that it stays in place. Add a small drop of black decorating icing onto the back of two edible eyes and attach to front and center of the Rollo candy. Also using the black icing, draw legs on top of the cookies, from the center Rollo to the outside of the cookie. Repeat for each cookie. Allow frosting to set for 15-30 minutes, then enjoy your spooky treat! Related: More spider fun! Check out these Chocolate Spiderweb Cupcake Toppers from The Soccer Mom Blog! 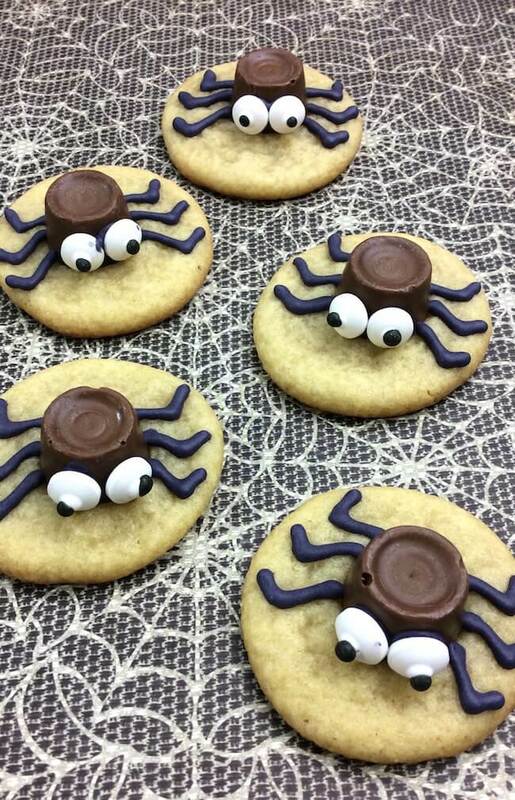 (Printable version of this Halloween Spider Cookies recipe available at the bottom of the post). 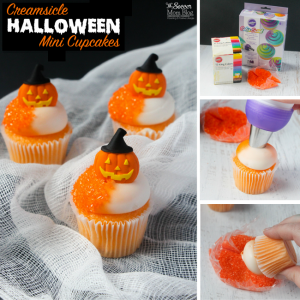 Allow frosting to set for 30 minutes, then enjoy your spooky treat! A non-candy Halloween treat that kids will love — Mummy Meatballs are a spooky fun party appetizer that’s ready in about 20 minutes! Usually at Halloween we think of sweet party recipes: candy, cookies, and other sugary treats. However, every party needs real food too! That’s why we love these easy Mummy Meatballs — they provide protein to balance out some of the special occasion sweets served at Halloween. Plus, they’re super easy to make! Related: Be sure to try our Mummy Hot Dogs recipe too! *We used pre-made meatballs to save time — these mummy meatballs are ready in minutes! However, if you’d like to make meatballs from scratch, we love these sweet Korean Bulgogi Meatballs too! 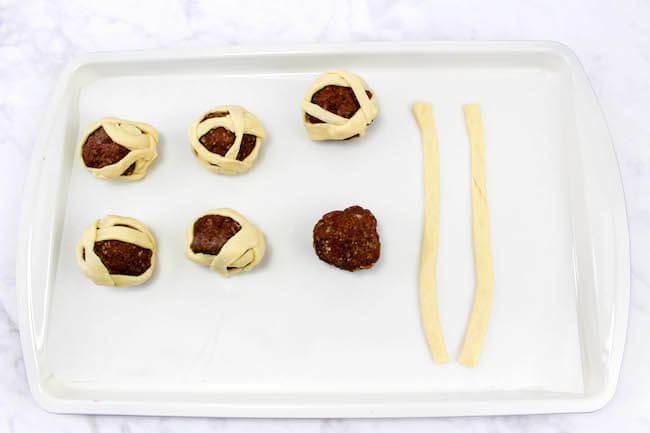 A free printable copy of this Mummy Meatballs recipe is available at the bottom of the post, after step-by-step photo instructions. Meanwhile, roll out the crescent roll dough and pinch the seams together. Use a pizza cutter (get one here) to cut thin strips, about a ¼ inch wide. Wrap 2 or 3 of the strips around each meatball. Be sure to leave some of the meat showing to resemble a mummy. Bake wrapped meatballs for 6-8 minutes or until dough turns golden brown. Dip 2 olive slices in a little marinara sauce and place on each meatball. Put a dab of marinara in the olive hole and place an edible eyeball (find them here) on each. Tip: To make a double batch, use 12 additional pre-cooked meatballs and 1 additional can of crescent roll dough. You should already have enough sliced olives and marinara sauce from your first dozen to cover a double batch. Want more Halloween party food ideas? Click here to see our entire collection of awesome Halloween Kids Snacks! Mummy Meatballs are a spooky fun party appetizer that's ready in about 20 minutes! Roll out the crescent roll dough and pinch the seams together. 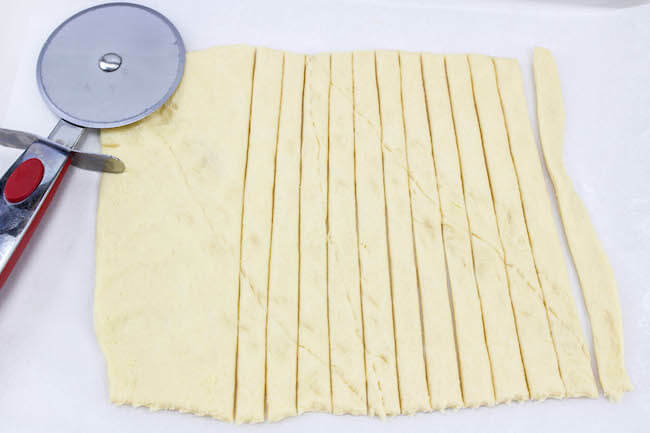 Cut dough into thin strips, about a ¼ inch wide. Wrap 2-3 of the strips around each meatball. Be sure to leave some of the meat showing. 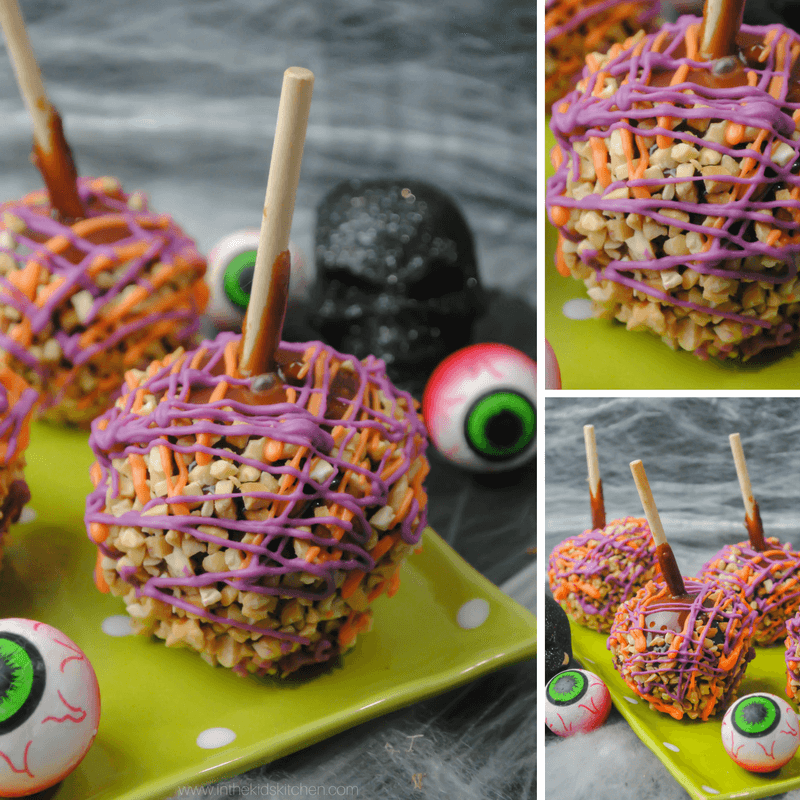 A spooky twist on a classic treat — both kids and grown-ups will love these crazy colorful Halloween Caramel Apples! These healthy-ish treats are as much fun to make as they are to eat! A candy apple decorating station is the perfect activity for a kids Halloween party! You could also make ahead and pass out to trick-or-treaters or create a show-stopping dessert display at your Halloween event. Easy to make and fun to eat, plus they store well in the fridge for up to week. Grocery store apples usually are coated in wax to protect them. Make sure to remove the coating before starting to make the caramel apples. PRO TIP: We love Eat Cleaner Fruit & Vegetable Wash because it removes wax coating, pesticides, and contaminants in seconds! Push a candy stick into the core of each of the apples. Cover each of your cookie sheets with wax paper, taping down each end. Sray the lined cookie sheets with non-stick baking spray. Next, unwrap your caramels and put them in a glass bowl with 2 tablespoons of water and put it in your microwave. Put the bowl of caramels and water in your microwave cooking on heat for 2 minutes, stir and then return to the microwave for another minute, continue repeating this process until the caramel is fully melted. Pick up each apple by the candy stick with a fork under the bottom of the apple dipping it into the melted caramel. If necessary use a spoon to cover the apple with the caramel. Place each dipped apple on the wax papper lined cookie sheet. When your apples are done place in your refrigerator to cool for about 5 minutes. Dip each caramel covered apple into the bowl of peanut bits and roll the sides of the apple in the apple bits. Place back on the wax paper. ALLERGY TIP: You may sub rice crisp cereal for nuts and still have a deliciously crunchy coating. Return to the refrigerator for 15 minutes or until the candy is firm on the apples. Melt the purple and orange candy melts in separate bowls in the microwave, one at a time. When the orange candy is melted completely (following the previous steps) pour it into a plastic squeeze bottle and drizzle each apple and set asside to cool in the refrigerator. Next, melt the purple candy melts and pour it into another plastic squeeze bottle and drizzle the purple candy on each apple. Return to the refrigerator until the purple melted candy is hardened. Grocery store apples have a wax coating. You will want to remove the coating before starting to make the caramel apples. The traditional way to remove the wax coating is to dip your apples in a pot of boiling water for a short amount of time. When you remove the apples, one at a time, from the pot of water, use a rough cloth to wipe the remaining wax off of the apples. Set aside to allow your apples to cool. (Make sure that your apples are dry). Push a stick into the core of each of the apples. Cover each of your cookie sheets with wax paper, taping down each end. Sray the lined cookie sheets with baking spray. Ready in 5 minutes! 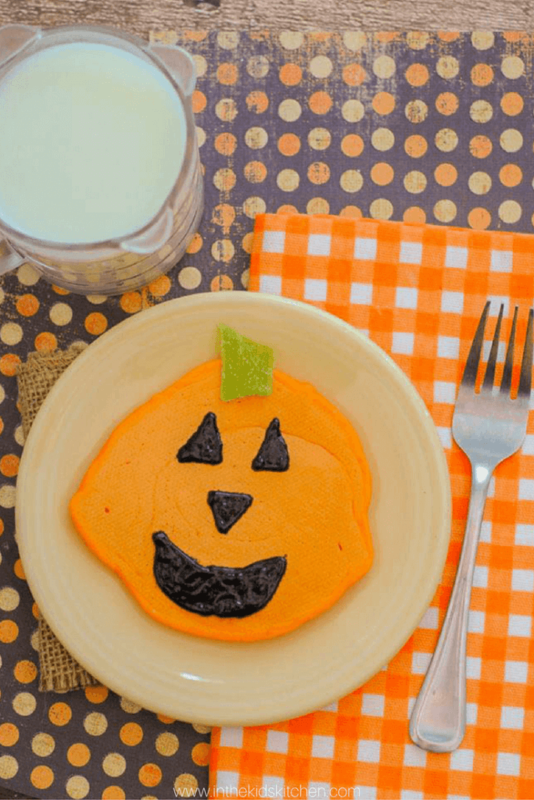 Your kids will love this special spooky breakfast and you’ll love how easy these Jack O’Lantern Halloween Pancakes are to make! 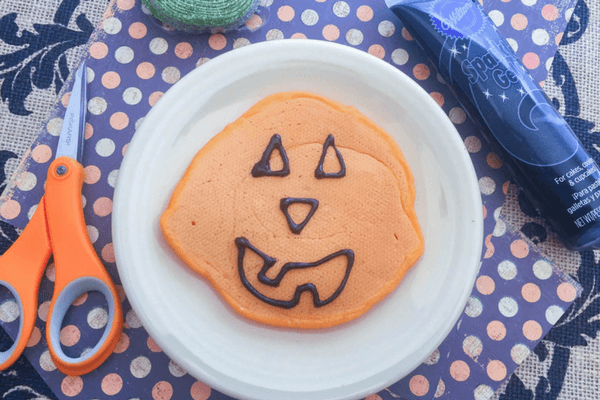 It’s easier than you’d think to make a fun and festive Halloween themed breakfast — you can whip up a quick batch of these Jack ‘O’ Lantern Pancakes in just minutes! 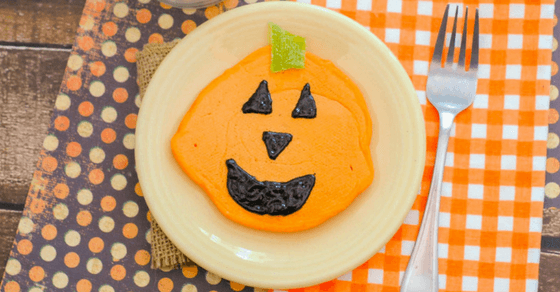 We keep things easy by using black frosting to draw the face, or you can skip the frosting and simply do orange “pumpkin” pancakes. Pro Tip: Make your pancakes taste like pumpkin too! Replace 1 Tablespoon of the melted butter or oil with 1 Tablespoon of pumpkin puree. That will also help dye the pancake batter naturally if you want to reduce the amount of food colouring in the pancakes. Preheat your skillet or frying pan over medium heat. Add in the milk, egg and melted butter or oil; mix until smooth. 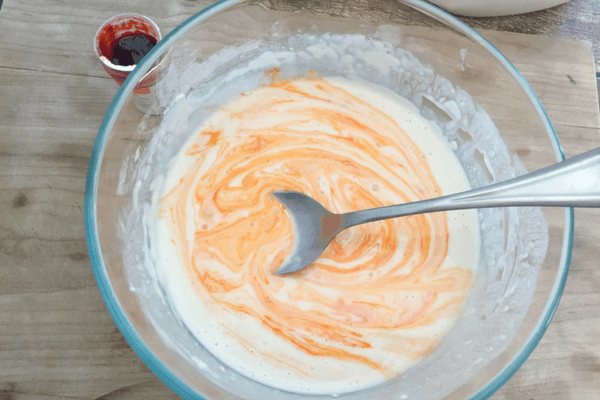 Add in orange food color slowly until you reach your desired colour – this is why I like gel food colouring because you can use very little and it makes a big impact. Grease or oil your skillet to allow for easy flipping. Portion out 1/4 cup of batter onto your skillet per pancake. Space them out so that they can spread out without touching. Cook until small bubbles have formed completely on the upper side, and then flip. Cook through and remove to cool slightly, if decorating. Using your black gel frosting pen, draw the outline of your pumpkin face features, and then fill it in. Add a small piece of green fruit leather for the pumpkin stem, and serve. Add in orange food color slowly until you reach your desired colour - this is why I like gel food colouring because you can use very little and it makes a big impact. 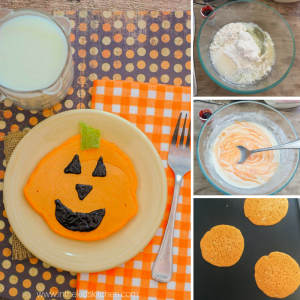 Would your kids love these Jack O’Lantern Pancakes for a spooky breakfast treat?